550 pages | 163 B/W Illus. The Science of Water: Concepts and Applications, Third Edition contains a wealth of scientific information and is based on real-world experience. Building on the second edition, this text applies the latest data and research in the field, and addresses water contamination as a growing problem. The book material covers a wide range of water contaminants, the cause of these contaminants, and considers their impact on surface water and groundwater sources. It highlights the three distinct and separate sources of freshwater: surface water, groundwater, and groundwater under the direct influence of surface water (GUDISW). It discusses the conditions that constitute GUDISW and the Surface Water Treatment Rule (SWTR). It also explores sustainability and the effect of human use, misuse, and reuse of freshwater and wastewater on the overall water supply. Designed to fill a gap in the available material about water, the book examines water reserve utilization and the role of policymakers involved in the decision-making process. The book provides practical knowledge that practitioners and operators must have in order to pass licensure/certification tests and keep up with relevant changes. It also updates all previous chapters, presents numerous example math problems, and provides information not covered in earlier editions. The Science of Water: Concepts and Applications, Third Edition serves a varied audience—it can be utilized by water/wastewater practitioners—as well as students, lay personnel, regulators, technical experts, attorneys, business leaders, and concerned citizens. "This book contains a wealth of scientific information. The text addresses water contamination as a growing problem, including the cause of the contaminants and their impact on surface water and groundwater sources. It highlights three distinct sources of freshwater: surface water, groundwater, and groundwater under the direct influence of surface water. It discusses the conditions that constitute GUDISW and the surface water treatment rule. It also explores sustainability and the effect of human use, misuse, and reuse of freshwater and wastewater on the overall water supply." 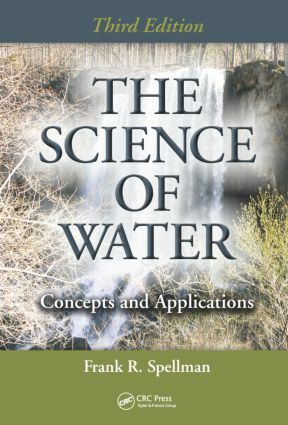 "The third updated edition of The Science of Water: Concepts and Applications belongs in any serious college-level or engineering library covering water science and technology, and packs in scientific information blending with real-world water management and science. It updates the second edition by offering the latest revised data and research, considers the growing problem of water contamination, examines sources of freshwater and accompanying issues of sustainability, and considers the impact of human use habits on freshwater and wastewater. From how policy makers influence water use and distribution to the science of water management and stabilization ponds, this weighty coverage is replete with the tables and formulas professionals need to understand the concepts and applications of water science in the field, making it a pick for any involved in water or wastewater management." "This is a book very useful to everyone involved in water treatment. It provides information ranging from water treatment to water source management to managing water rates. If a bench chemist wants to know what people in the management section are thinking about for setting water rates, this is the go-to book. If a manager with a business background comes from outside the water treatment field, the economic section of the book will be useful for getting up to speed. Likewise, anyone in non-scientific fields will get an excellent overview of the technologies of water treatment and source water monitoring without excessive technical jargon, equations, and chemical symbols." "Mr. Spellman is to be commended for pulling together a vast amount of water-related material from diversified sources such that this book can be the first (and in some cases, last) book to turn to for information on water." How Special, Strange, and Different Is Water? Biology and Microbiology: What Are They?